Tap Heroes - Welcome to the first puppet show RPG! Enjoy the show! Welcome to the first puppet show RPG! Enjoy the show! Welcome to the first puppet show RPG! 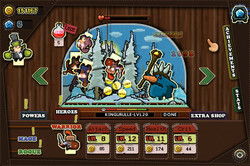 Battle tons of foes, buy new upgrades, cast magic and recruit new Heroes. Or just sit back as your Heroes do the fighting while you relax or do other things. But just remember that you need to make sure your heroes are strong enough before you leave them to their own, especially if you are about to face a Boss! Enjoy the show! The game is available for $2.99, but the winners of our contest will get it for free. How would you improve Tap Heroes? To community members not receiving keys, please read the tenth comment posted by the giveaway team in the Beholder comments section, which can be found HERE. Hopefully the post will explain what the problem is. I have the same problem using the email I always sign into these comments, however when they first offered Steam keys I used a different email. I checked that today and found the key at that email, not the one i signed into the comments section with. I would check all emails you've used previously to see if the key has been sent to one of those. Please let us know if you do find the key at a different email as this will spur others on to check. thank you. A role playing (RPG) clicker puppet show featuring heroes, magic and boss battles. If you get a key for Tap Heroes, please give some feedback about your opinion of the game, for example, what you liked or disliked about it, or how it could be improved from your point of view . If you don't like this genre at all, please explain why. What improvements, if any, would change your opinion? There are thousands of subscribers to the game giveaway of the day every weekend which makes this an ideal forum for giving developers fresh ideas as to what their consumers (i.e. you) would like to see in a game. For example, you could suggest extra content such as better or more original mini games, or a level editor that you would like to see that would make it more appealing to you. Maybe you think the graphics are a little dated and are in need of re skinning, or maybe you've just had enough of the genre and want to see something different or something with more originality? If you don't mind playing games via Steam or miss the offer totally you can get the game 24/7 via Steam HERE. It usually costs £1.99. apparently there's a Steam sale starting from 23rd Nov to 29th Nov, where you are likely to get the game even cheaper. The BIG Christmas sale starts on the 22nd December until 2nd January 2017. Welcome to the first puppet show RPG! 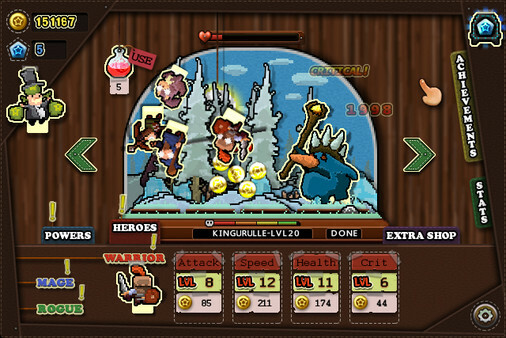 Battle tons of foes, buy new upgrades, cast magic and recruit new Heroes. Or just sit back as your Heroes do the fighting while you relax or do other things. But just remember that you need to make sure your heroes are strong enough before you leave them to their own, especially if you are about to face a Boss! Then create a Steam profile/account. Once that has been completed you can input the Steam code that you've received (after completing the form filling) via the game button along the top of the Steam client, (located between friends and Help - see image below). From the drop down menu select 'Activate a product on Steam'. This opens a product activation window. Just follow the prompts to complete activation. Once the Steam code has been accepted, the game will be permanently associated with your Steam account and can be installed any time you wish. 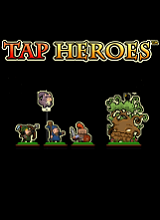 Varagtp's Tap Heroes is a simple idle/incremental RPG that will feel fairly familiar to you if you've played Clicker Heroes. You start off with a simple warrior in a forest, and you click on them to heal, while clicking on enemies deals damage. Slain enemies drop coins you can use to upgrade both your clicking strengths and your party, and after you've knocked off ten monsters in one area, you can move on to the next, where they'll be stronger, but your rewards will be even greater. Every so often you'll fight a powerful boss, and slaying it will earn you diamonds that are also dropped randomly while playing and which you can spend on more party members or other upgrades like the coin doubler. If you're already sick of the clicker genre, Tap Heroes isn't going to do much to win you over. It's fun in the way all of these games are, a frenetic mix of arcade clickery and the simple satisfaction of upgrading and bigger numbers, but despite elements like the way the wizard and the rogue both have different abilities, it still doesn't offer much in the way of depth. The incentive to play is largely seeing what new areas and monsters you discover, and in that the game's lovely Paper Mario-esque retro visual style is a large mark in its favour. Tap Heroes may have been done before, and likely could use some fleshing out to make it stand above the crowd, but its oddly addictive and easy on the eyes, making it a solid addition to an increasingly popular genre. The idea is that, you can play along by tapping the left or right side of the screen, which will definitely get you more coins, gems, and experience points. Or, you can simply watch as a bystander and see how your heroes manage on their own. The level of participation is dependent on you. The landscape two-dimensional screen looks like a cut-and-paste puppet show. The heroes and monsters appear to be sitting on top of sticks. The surrounding frame could be the window of a puppet theater booth. Your heroes and their stats are displayed at the bottom of the screen, along with their current level and the cost to upgrade each stat. The achievements section, which is the main reason to play the game, is accessed by tapping the tab on the right side of the screen. Your game stats are available from the tab right below the achievements. As I mentioned above, your level of game play could amount to zero, if that is your preference. 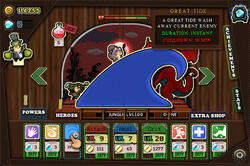 However, if you want to participate in the game, tap the right side of the screen to attack and tap the left side of the screen to heal. If you do nothing, your heroes will perform both actions on their own, but not as fast. As you earn coins, use them to purchase upgrades for your heroes and powers. The higher your level, the faster you can defeat your enemy. You can also earn gems, which are used to buy special powers, like the Great Tide. Once purchased, these powers can be manually activated at any time, but have a lengthy cool down duration. The key to earning more gems, which are rare in this game, is to earn achievements. The first couple of achievements in a category will only earn you coins, but once you make it to the harder tasks, you’ll begin earning gems instead. For example, you will earn a gem for defeating 10,000 enemies, or tapping the screen 50,000 times. So, while the game may continue without your interaction, it behooves you to participate so you can earn gems. There is both a free version and a paid version of Tap Heroes. The only difference is that the paid version comes with the Familiar Pet, which you could get from the free version with gems. The replay value is definitely high since you can play through at least 100 locations. You don’t even have to play. Just watching the heroes fight is good enough. Tap Heroes is such an easy game that it can literally play itself once you get a mage in your party to heal the warrior. At first you start off with a warrior that will auto attack the enemy, but if you want to vanquish it faster, click on it lots of times. I mean lots. No. More clicks, keep on clicking. If you're low on health, all you need to do is click on yourself until the health bar is full. There doesn't seem to be any cost to healing yourself, but the only downfall to healing is that you're not attacking the enemy as fast, or at all, unless you have the rogue in your party. The rogue shoots arrows that stun and poison foes. With gold coins dropped from defeated monsters like bees, bats, tigers, pigs, and Venus fly traps, you can upgrade his speed and potency. Each upgrade will cost more than the previous one so keep on saving your gold and spend your money wisely between all of the party members. The healing mage is the first un-lockable character that you can purchase with gems dropped by bosses or found in random treasure chests. Gems can also unlock temporary boosts that can recharge over time including the ability to do double damage, earn more gold, summon a tide to wash away an enemy, or heal twice as much. In the extras shop, potions, banks for dropping more gold, and an attacking familiar can also be purchased with gems. Last but not least, gems can be placed on an altar to upgrade abilities. As you progress through the three hundred levels (if your fingers can take it), the enemies get stronger and take more effort to knock out. 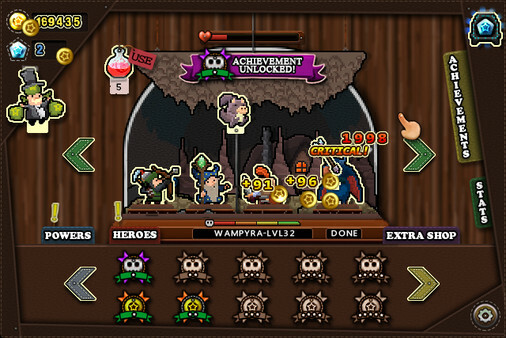 Each level has ten monsters that have to be defeated to manually switch to the next level. Moving forward is optional and you can let the game play itself if your warrior can hold his own and the mage heals him enough. Every tenth level has a boss and these battles will require constant healing to survive their powerful attacks. If your characters are leveled up enough, it doesn't take much skill to keep pressing forward. The only limitation is how much clicking can you stand doing before getting bored or having your fingers get tired. This game seriously numbed my fingers as I played it and I don't recommend it for anyone suffering from carpal tunnel. Even though Tap Heroes is kid safe, mine got bored with it after a few minutes. The asking price is only $2.99, but I'd wait for a sale before picking it up. You can see 255 mixed reviews from the Steam community for Tap Heroes HERE, and if you want to see some game-play you can see some videos of game play HERE, HERE, HERE and HERE. I never thought I'd ever play a clicker game, but when I noticed several of my Steam friends playing one over the summer, not just once or twice, but day after day, (the free to play Insanity clicker) I was curious so installed the game and started playing it. I ended up with over 700 hours of game play, though a lot of it was played using one of those auto clickers. Tap heroes is a similar clicker game in that it can become very addicting initially, tohugh i found this particular game not as riveting as Insanity clicker, but that could be the fact that once you've played one, there's not much else to see a smost of these clicker games are basically the same, just with a different graphic. I have noticed a few of my friends are now off Insanity clickerand playing another free to play clicker game called Clicker Heroes. Once you've had enought of Tap Heroes I suggest you try both Insanity clickerand Clicker Heroes as neither will cost you a penny. I'd like to take this opportunity to thank the developer varagtp for giving away keys for this Clicker game and also to the game giveaway team, as always, for securing other ways to get free games, in this case a Steam key. If today's game was not to your liking, you may find other games either free or for less than the price of a cup of coffee (from your favorite coffee house) via the 'Weekly Roundup of Game Deals' thread which I've posted a link to above, or HERE. You'll also find links to all of the good Indie bundle sites such as Bundle Stars, Humble Bundle, Groupee's, Indie Gala etc. Follow the link I've provided to the Games deals thread over in the forums for links to all of those sites. There are well over 40 indie bundles live at this time, most over at Bundle Stars. Good news for those who have Desura accounts . The platform has been purchased and will be up and running again soon. The previous owners went into liquidation April 2015 and the site although still operating has not been updated since that time; however, the new owners are working on clearing up the site at this time. They have also acquired the Indie Royale and Daily Royale site as well, so for those who purchased Greenlight bundles of which there were at least 20 of them, with a total of over 140 potential Steam keys, many of which I know have since been Greenlit, so hopefully we may eventually get Steam keys for those games (finally). It's been over a year since Indie Royale went dark. The latest free game over on Origin is still the excellent (though now dated) RPG 'Dungeon Keeper'. You can get it HERE. Please note that you do require the Origin game platform to be able to download and install the game. Whiterabbit-uk, I have no problem with Steam games, the problem I have with these type of giveaways is that I have to have a "facebook" account; No Thank You! Hi Jon, when I clicked on the Facebook button, it opened the log in page, but i didn't log in. I don't have a Facebook page either. I went back to the giveaway page and the task was completed even though I didn't log in. The first task took me to an unobtainable page, but i still got the tick. As soon as both tasks had been completed I got a message saying a code/key had been sent to my email address. I've performed both tasks, but didn't get a key. And a message sais I need to perform them still. What else? No funciona más al parecer. You just redeemed a product on HRK Game. Seems to be over, I didn't receive any key, doesn't say the key was sent after I completed both steps. And I only have this email. Seems to be over, I didn't receive any key, doesn't say the key was sent after I completed both steps. And I only have this email. Sooooo...when and how do I get my key? I've fulfilled both of the steps, which is verified by them having check marks. But nothing happened here on the page, and when I check my email that I provided as part of the process, nothing is there, either (yes, I checked my junk folder). What do I do now to get this straightened out? Thanks. Sooooo...when and how do I get my key? I've fulfilled both of the steps, which is verified by them having check marks. But nothing happened here on the page, and when I check my email that I provided as part of the process, nothing is there, either (yes, I checked my junk folder). What do I do now to get this straightened out? Thanks. Perform the 2 tasks, i can`t get the key. Perform the 2 tasks, i can`t get the key. give me key please. Ended? I can't receive anything from my email. Please read the first few paragraphs of my review. It points to a comment made by the giveaway team about this issue. Basically if you are using a different email than the one you first used to sign in, keys won't be sent to the new email, but to the old one, so please check any other email you may have used previously. Thank you. I mean, I already completed the 2 tasks. I didn't get a message saying I received a code in my email. I mean, I already completed the 2 tasks. I didn't get a message saying I received a code in my email. Estoy bien, espero que estén demasiado, estás teniendo problemas para obtener una clave? That's weird. Try using a different browser. I've not seen it presented with only one task. Maybe you've already signed in? Check other emails you may have used to sign in previously. Even if you sign in with a different one, the keys will always be sent to the first one you used. Over the last few weeks I've checked this by signing in with different emails, but the keys are always sent to the one I used the first time. i didn't see any green button to get the key. is it gone already? thanks for the reply. i did the two steps provided above but i didn't see any key. i also already checked the email that i used for the first action and there is no key over there. did i miss something? Am I too late? I'm only getting one step, unless signing in is the first step. Either way, I'm not getting a key. I don't understand why you are only getting one task to complete. Once you've signed in you should see two tasks. See the images I've posted in your other comment. Try clearing out your internet cache, at least the giveawayoftheday cookies. That may clear the problem. Otherwise try using a different browser. Just to clarify - I signed in & watched the video. What 2 steps did others have? Once logged in using the email you first used to log in (if you use a different email to the one you first used when logging into the site you wont get the key sent to that email, but to the original email. you must use a valid email and not a throwaway one. The following will show if you haven't signed in when you first click on the tasks. Once signed in clicking on the first task will open your browser to the developers site, the second task will open up the login for Facebook. Once logged in you should get a message saying a key has been sent to your email. Thank you for responding! I did try deleting cache and still had same issue. I went to a different computer, same browser, and it worked. If you're interested, the PC that the site was only giving me one job was Windows 7. The laptop that worked is Windows 10. Both Google Chrome. I still haven't gotten a key (about 20 minutes). I hope I get one before the giveaway ends. Program looks fun (and I like Steam) but not enough to give up my Facebook information. Very scary that when I clicked the Facebook Share button, something (Facebook or GAOTD?) already knew my login and e-mail, even though I'm NOT logged in to Facebook (rarely use it) and have all Facebook scripts disabled. Very scary. I'm staying away from these gaveaways where I have to perform "actions", I sincerely do NOT want all my Facebook friends getting spammed and don't want them to think I recommend things I haven't even tried. I have a Facebook account specifically for free software. A lot of the free sites now use Facebook as a step to getting their software and games. I don't use the account for anything else. Just a suggestion. I don't subscribe to social media...just email. I can't download this game other than through email...but there's no email option. I don't think you need to. As mentioned in other replies, I clicked on the Facebook button, which opened a log in page, but I didn't log in. I returned to the giveaway page to find the task had been accepted without logging in, That would indicate you don't need a live account. Perform the two tasks and instantly get the key!'' You need to make sure you are logged in using one of the provided buttons i.e. email, Facebook, Twitter or Steam. Once logged in click on the first button which says check out the mobile version of Plantera. When I clicked on this it took me to an unknown page. when I clicked on the giveaway page the task was checked indicating it had been accepted. Then click on the second Facebook button labelled ''Share the game giveawayoftheday page'' This should open a log in page for Facebook. Once completed the second task should be checked and you will get a message saying the key has been sent to your email. Hi Jig, send a screen capture of the page showing once you've clicked on the second step. Take as many images as needed. Upload to the same place as I upload my images to. To get there just click on one of the images in my review. Once there click on the 'Do not resize my image' and choose either 800 x 600 or 640 x 480, (I use the smaller image size, but if the text is small, it may be better to use the larger resolution. Then click on the choose image button. You can upload all images en mass. Once uploaded click on the button to the side that says Thumbnail for forums and from the drop down menu select hotlink for websites. Select the codes delete the end bits that say < b > and < / b >. The images will then show in these comments. So this is a game where you have to do absolutely nothing? Eh. What's the point? If you do nothing, you won't progress through the levels. This type of game isn't for everyone. I never thought I'd enjoy playing such games. They seemed pointless to me. But I noticed several of my Steam friends playing one of the Free to play versions (Insanity Clicker) over the summer. Most of those playing appeared to be playing every day and for hours. On checking a few of their profiles i saw that they had been playing the game for unbelievable amounts of time, so i decided to install and check the game out. I have racked up well over 500 hours playing the game. Playing it for hours every day for several weeks. The only thing that stopped me was my daughter trashed my computer (burnt out the motherboard, some RAM sticks and the graphic cards ). Some of those friends ar now playing another Free to play clicker game at this very minute called Clicker Heroes. It's one of those games you'll either get hooked on or throw away after a few moments. Their is something oddly addictive about them, partly their simplicity, and then the ease at which you initially upgrade. with rewards and achievements, these games become quite attractive to those Steam users who like to collect achievements becasue the achievements are easily collected. Hi Abdou Dz, you need to complete the two tasks, then the key will be sent to the email you provided. I use a particular email, but the email the key was sent to was the email i first used to register; so, if you are using a different email than what you originally did, it will be sent to the firs tone you used. confusing i know. The giveaway team explained this a couple of weeks ago when one of the limited Steam keys was given away. I'll see if i can find the post if i have time. I'm a little busy deleting spam posts from the resident troll. If you ;look back over the last few weeks you should find the comment they posted that explains the issue. We are gradually running out of keys, but the developer has already requested another pack. It may take some time before we add the keys to our database, so if you get the "no more keys available" message, please, try requesting the key a bit later. Have you thought anymore about using a vpn blocker as the troll that has been posting today and previous weeks is getting a little out of hand. I don't have time to spare to delete hundreds of comments every time he decides to make an appearance. He actively gloated that we wouldn't be able to ban him from the site as he was now using VPN to route his comments through different IP addresses, but WordPress does have an add-on that will block such posts. This guy needs to be put in his place. Thanks. Thanks a lot for the report. We will forward the issue to our tech team on Monday, hope they'll find a way to deal with it. Thanks. The troll has been busy today, but it's not much of a hassle to put them in the spam bucket. :) As I said, there is a anti VPN add-on that can be applied to the site, which should stop the troll. Other months, the Like button of Facebok GGOTD would work . Today the share button only works for those with a Faceybook account. I'm guessing Swampy is commenting today on the fact that todays Game is only for those (Free) with Facebok. And apparently Don't punch in any letter wrong for \name or e-mal or it messes yu up. I am OK with passing on today GGOTD, I was a little unsure I wanted it, but after rewiew and reading a little I was trying for it. I think you are correct, but I'm not going to even mention the trolls name anymore. i'm hoping the Giveaway team will add a VPN blocker to the site as WordPress does have such an add-on. It needs to be done. Hi Martin, hopefully the giveaway team will see your comment, but just in case, I'd contact them directly. You could also try contacting the developer. He may give you a key directly. Take a screen capture of the message you get that tells you it's already been used by someone else and send that on to them as proof. Let me know if you get it sorted or not. Please read my replies to others. You have to complete two tasks. The key should be sent to the email you used to log into the giveaway site to be able to post a comment. If you've used other emails previously, check those as well. Comentario eliminado debido a un lenguaje inapropiado. Este es un sitio de la familia que los niños visitan. Si usted no puede averiguar cómo obtener una llave, no obtendrá ninguna ayuda de esta comunidad debido a su actitud. CAN SOMEONE PLEASE DELETE THIS DISGUSTING COMMENT? THANK YOU. Thank you for your hard work, as usual, WR. Looks like you need Facebook to get the key. I canceled my Facebook account definitely. I didn't sign in, just opened the log in page, then returned to the giveaway page and saw that the task had been checked even though i didn't log in. 20 minutes or so and nothing. Hi Dave, The giveaway team posted a comment about this some weeks ago. If you've used other emails on this site previously, please check those emails as well. for some reason the first email you used will be the one the game is sent to. I didn't receive any keys using the email I've been using for ages, then discovered that they had all been sent to another email I'd used some time ago. The team explain it better than i have. I don't have time to direct you to the comment, but it was posted a couple of weeks ago on one of the Steam key giveaways in response to this same issue. Hi sunghoon lee, please read my previous comments. i got a duplicated key- at least i didnt payd any money for it ^^"
Please read my replies to other community members with the same issue. Thank you. is a very good game and is enjoyable!! Contact the giveaway team. They may be able to change it. If you can message me over in the forums with the correct email and the email you typed in I may be able to edit it for you. Don't post your email directly though because we have a troll. sure. Reload the page and try again. Jean, Sounds like you need to delete the cookie for the website you're having a problem with... To delete a cookie in Firefox (for other browsers you'll have to do a search in your favorite search engine for "delete cookie"): Tools-Options-Privacy-History-Show Cookies: Type the website name you accidently typed wrong (ex. facebook.com or game.giveawayoftheday.com), press enter. Scroll down the list and verify only the website you're having trouble with is listed and then hit "Remove All" when you're sure. Reload the page and try again. On game.giveawayoftheday.com my Facebook account is associated with the bad email and if i register with the good email (without Facebook), an error appears when i click on Share : "User account with such data already exists." Hi Jean, The giveaway team posted a comment about this a few weeks ago after several community members said they weren't receiving their keys. I logged on using my usual email, but I've never received any keys from the giveaway via that email. Instead, the keys, even though I'm logged in using my whiterabbit email, are always sent to a different email that i used when Steam keys were first given away. I got a message that the key is already activated by another steam user. I just can't get into 'Tap' games, esp. when there's buying upgrades, and pseudo-RPG mechanics. Yaay nice, finnaly STEAM game with easy steps. Thanks!